Sonic 1 on a mobile phone...before the iPhone port. Originally released through the Japan-only Sonic Cafe service (for I-Mode devices) and later ported to J2ME. 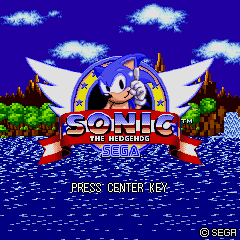 Depending on the service provider, the game was either provided as one full game or in two parts, as Sonic the Hedgehog Part 1 and Sonic the Hedgehog Part 2. This UFO was seen in early screenshots and footage of the Genesis original's Marble Zone, but why is this here...? Leftover graphics from the removed Special Stage remain in the data. 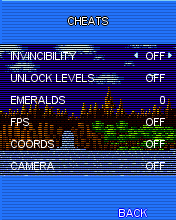 At the title screen, press 2, 3, 0, 6, 9, 1 (the US/Europe release date of the original game) to unlock the cheat menu. UNLOCK LEVELS: (Part 1 only) Allows you to play all of the levels from Part 1 and Part 2. This option doesn't exist in the Japanese release, as it wasn't released as two separate games in Japan. AMPHIBIOUS: (Part 2 and Japanese release only) Makes it impossible to drown. 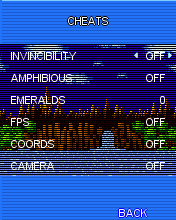 EMERALDS: Allows you to set the amount of Chaos Emeralds you have. FPS: Shows the current number of frames-per-second in the upper-left corner of the screen. COORDS: Shows Sonic's coordinates in the upper-right corner of the screen. CAMERA: Lets Sonic move in all directions without falling. Use # to toggle it mid-level. There was a second release of the game for Verizon phones that strangely removed all of the sound effects. This page was last modified on 18 November 2017, at 15:59.